Years ago, when we began pastoring a church, I didn’t know what a widespread issue anxiety and depression had become. Walking with families through different seasons of life has opened my eyes to both the triumphs and struggles so many experience. My compassion has grown exponentially. 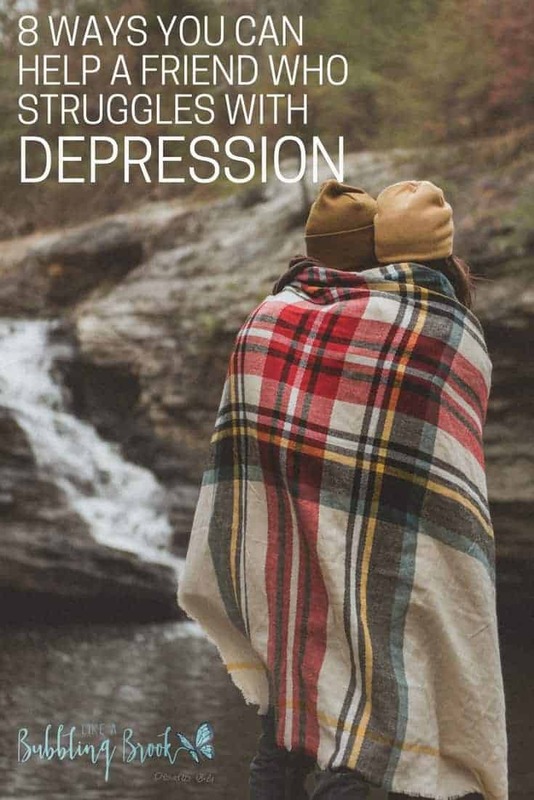 Did you know depression affects roughly 19 million adults each year? It’s bigger than just a “case of the blues,” and you can’t just shake it off. It’s real, and often overwhelming. If you are personally struggling with anxiety or mild depression, please read this and know there are many people who have walked this road and made it to the other side. I applaud you for pausing to read these words. Please share this article with a trusted friend so they can better help you. If you have a friend or loved one who is walking this road, then I pray these words will help you link arms with them and encourage them in their journey to healing. 1. Pray for your friend. This goes without saying, but she will need your prayers more than ever, as she is likely in a valley where it’s hard to pray for herself. Pray for God to give her strength in her body and clarity in her mind. Pray for God to give wisdom to the people around her, so they may speak words that heal and share resources that will keep her moving in the right direction: towards healing and leaning hard on Jesus. 2. Urge her to speak with her pastor and/or a mental health professional, and give her their phone number to set up an appointment. She needs someone to talk with, someone experienced, who has helped others navigate through periods of depression. They may also offer other local resources, or schedule to meet with her regularly and monitor her improvement. She will learn tools that help her think logically, because when you’re depressed, logic seems to disappear. Fear, guilt, and shame take over, whether they make sense or not. 3. Help her find a good family physician. For some, this can make all the difference in the world. Depression can be hereditary or caused by a chemical imbalance in the brain. It can also be caused by something as simple as a vitamin deficiency. Only a good doctor can diagnosis this and offer appropriate medical advice and treatment. If finances are tight, many communities offer free clinics, or clinics that charge lower fees based on a sliding income scale. 4. Ask her to be your walking partner. Did you know that regular exercise helps lift depression? Harvard’s Health Publication discusses this interesting research on exercise and depression in more detail. Just a few minutes a day can make a difference in her mood and also improve your own physical health at the same time! 5. Share helpful books and resources with her. Chances are, she may find it difficult to read through a book during her worst days, but it’s helpful to have resources available for the few times she’s up for reading. You can also research and read books for her, sharing helpful nuggets and tools with her during conversation. A few I’ve found particularly helpful while working with others are: Ordering Your Private World by Gordon MacDonald, Say Goodbye to Survival Mode by Crystal Paine, Hope in the Midst of Depression by Mary Southerland, and 7 Simple Choices for a Better Tomorrow by Bob Merritt. 6. Help her make healthy food choices. Depression makes cooking and housework nearly impossible, because every move you make seems like you’re wearing heavy weights strapped around your arms and legs. Making a meal is exhausting, but ordering take-out gets expensive for her family. Encourage her to have simple, healthy foods around the house. Take a hearty meal to her once a week (my personal recipe index is here). Share information about a good multivitamin you’re taking, or a smoothie your family enjoys. 7. Tell her what makes you laugh. She cares about you, and even though she may be fighting depression, she needs to hear about your life. The good stuff, the funny family happenings, and the day you accidentally wore two different shoes to church…those are perfect stories. Save the news, politics, and community crime drama for another season of life. We all know there can be times when mild depression turns severe. Perhaps you’ve lost someone to suicide. My husband’s father committed suicide many years ago, brought on by alcoholism. Sometimes, despite your prayers and very best efforts, your friend may need emergency help. If you’re close by, driving them to a hospital emergency room may save their life. And they should always have the phone number nearby for the National Suicide Hopeline (800.784.2433) or National Suicide Prevention Lifeline (800.273.8255). Thanks for this great list, Jaime. When I went through my season of depression, I could hardly read anything let alone crack open my Bible to read the life giving words there! 2 things that helped me was when a good friend would ‘spoon-feed’ special scripture verses to me – giving me just enough to hold fast to. And worship music. I could listen to worship all day. Thanks for linking up with Grace and Truth again! I just love this inspiration and encouragement! 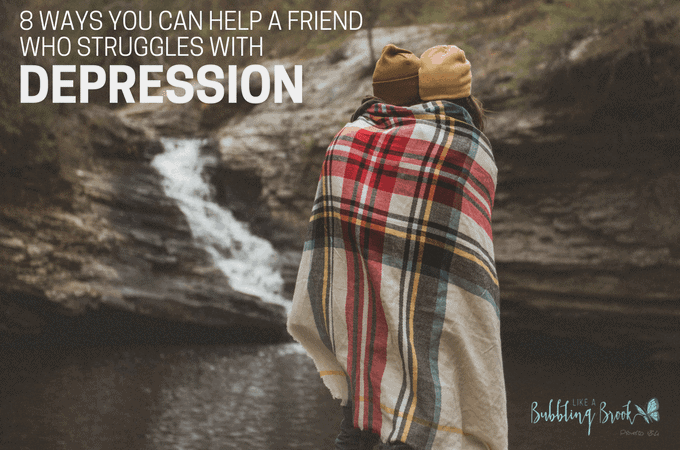 After walking through many personal hardships, I find that many people just don’t know how to help, even if they may want to help you through the darkness. I’m sharing this on Twitter today and have am now following you on all social media. It’s such a blessing to meet another like-minded blogger! Have a fabulous day! Thank you, Sarah! I enjoy your site and have shared a couple of your posts. So nice to “meet” you! I’m glad you stopped by! Just tonight found you listed on a link party and clicked on the little block. I am so glad I did. I have suffered from depression and anxiety for many years. I look forward to receiving your future post. I’m so glad you’re here, Treva! These tips are so great and vital for anyone who is suffering. Just reach out and check on your friend. They often feel forgotten so these tips are so helpful. This is an excellent conversation. Thanks for sharing with us at Merry Monday. Prayer changes things. I recently spoke to my husband the need to finally speak with someone. It is hard to ask for help sometimes and it is hard to open up, however, it can also be savior that you need. Thank you for this article.